Patreon is a space where you can come inside my Treehouse Studio for a virtual cup of tea (or pint of beer, whatever) and be a part of the ever-growing World of the Woolbeasts. As a Treehouse Member you have behind-the-scenes access to my art and work: an in-depth look into my processes, what I'm learning, and what inspires me. There are a few different levels of support for Treehouse Members, starting at $1 per month. This support makes the Woolbeasts possible, by allowing me to focus on creating. The support I receive is put directly into the art that I share - in materials and equipment for making things, as well as freeing up my time so that I can create more! A postcard when you sign up! Access to my private Patreon Blog where I share works in progress, news and notes from the studio, plans, drawings, and the occasional late-night ramblings on art, life, life as an artist, and everything else going on. Monthly original art! Each month you'll receive a small original illustration. 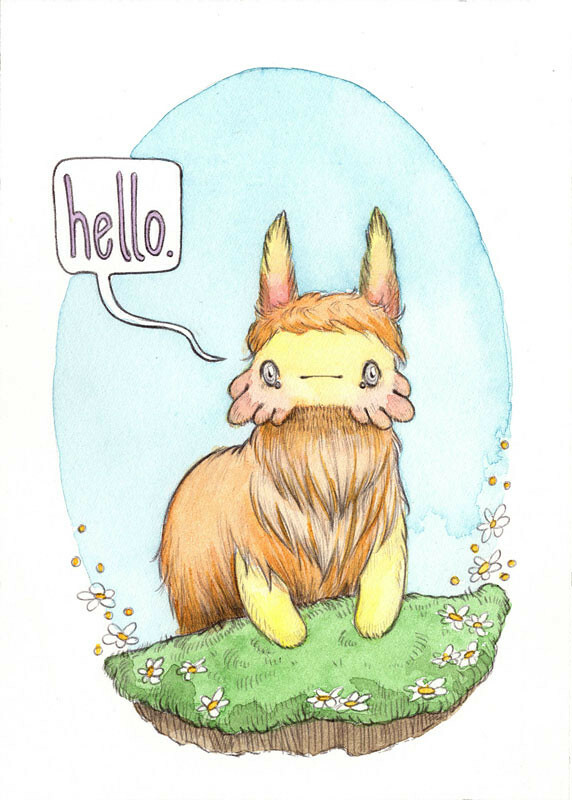 These are either 3"x5", or 2.5"x3.5" (ACEO size). These will be exploring the world of the Woolbeasts, but may also sometimes be of other creatures of folklore, myth, or your suggestions! *International supporters outside the US may be asked to help offset shipping costs. Please feel free to contact me for a shipping estimate. Thanks for understanding! Let's grow the Woolbeast world! When we reach 50 members I'll celebrate with new color stickers for everybody!